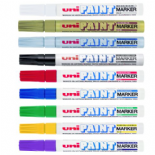 Uni Paint PX-20 markers are highly versatile markers which will write on many materials. The Uni Paint PX-20 medium tip Paint marker from uni ball is available in 11 colours and enables drawing on any surface including photographs, Metal, Glass, Wood and Plastic, the oil based ink is both fade and water resistant and so will not run or fade after time. This medium sized 2.2mm - 2.8mm fibre tip is also perfect for numerous arts and crafts uses.